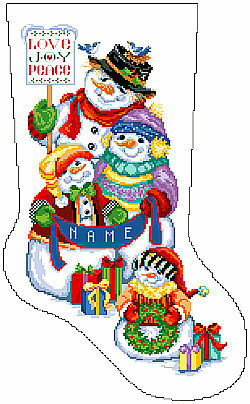 This precious Snow Folk family stocking design will delight anyone who loves to share in the festivities of the season. This bright and cheerful snow family in Counted Cross-Stitch will brighten any snow lover's mantle and Santa is sure to fill this stocking to the brim. Contents: Stitch Count 127w X 217h, Finished Size 9" X 15-1/2"